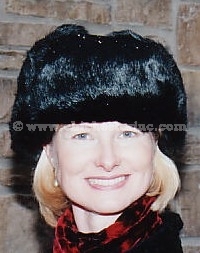 These hats are high quality fur hats made for the Russian winter. They are well made, very warm, and fashionable. The fur hats are lined and made from high quality black rabbit fur. The ear flaps can worn up or down depending on the weather. Other colors (natural, gray, and white) are available on a custom-order basis.